August 10th at the Nichol farmhouse (circa 1876?) at Raccoon Creek Sate Park in southwestern Pennsylvania. Park volunteers long ago planted a bed of mint at the farmhouse. 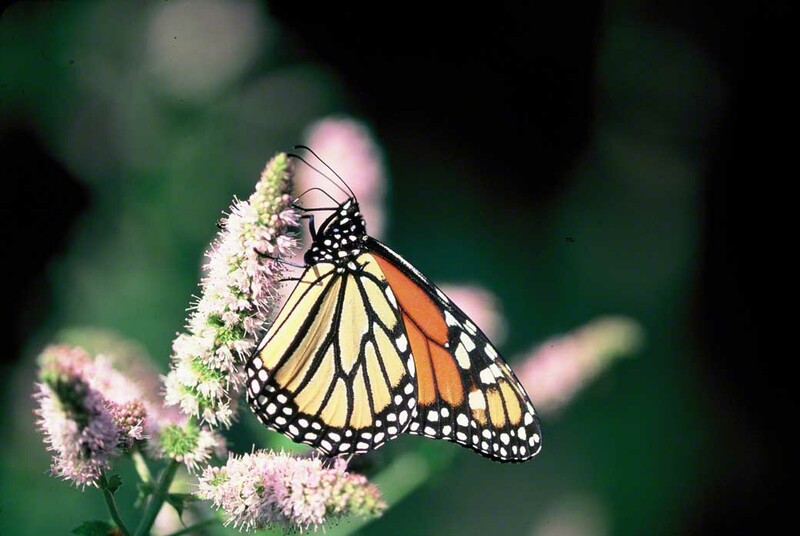 Long awaited, the aroma of the mint flowers certainly drew in our exquisite Monarch butterfly. She calmly moved from flower to flower, enabling me to photograph her at will. Long ago I learned that folks much preferred images of butterflies with intact wings. So, so many times we spot an exciting find, a species that is rarely encountered . . . and then after slowly stalking up, oh no! Bits and pieces of wing, gone. Ripped by pursuing birds and insects . . . and who knows what? Monarchs are like the gold of the butterflies. 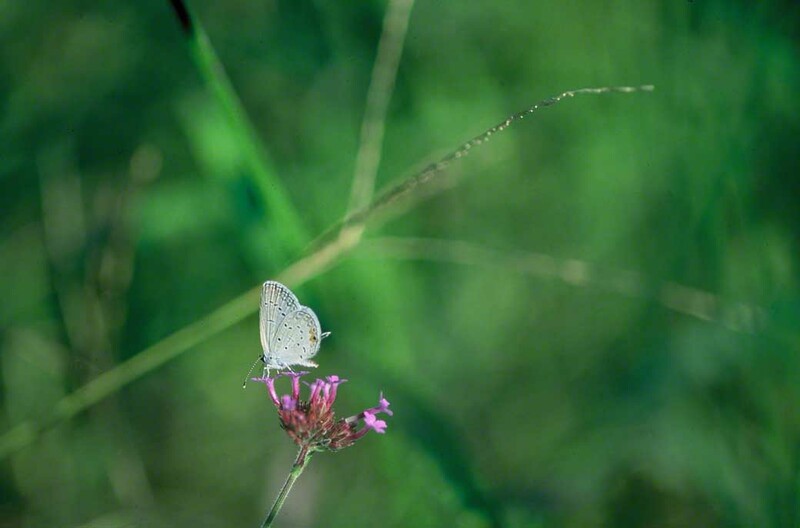 They afford the earnest photographer of butterflies the assurance of beauty of shape, color and whimsy. Danaus plexxipus. The treat on the wing. So, we once again broadcast out the query of our last post. Did she fly south from Beaver County, PA to West Virginia or Maryland or Ohio? Then, did she or her progeny cross the Gulf at Alabama, Mississippi or Louisiana? Shouldn’t she have already left Pittsburgh and be in West Virginia or Kentucky? It’s September 22nd and our Danaus plexippus is methodically nectaring on tall verbena flower heads in the Outdoor Gardens of the Phipps Conservatory. Smart lady. Surrounded by expansive beds of verbena, zinnias, asters and more, she is preparing for the long flight ahead. How fortunate is she to have little to fear from the animals about that would otherwise prey on such a vulnerable prey. Our recent Monarch butterfly post discusses why she has little to fear and why that is. So there she is. 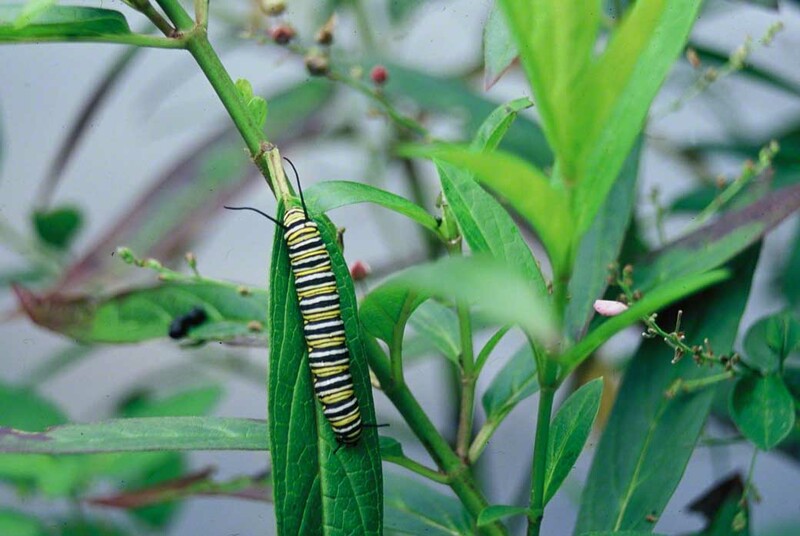 It is likely that she has mated and already deposited her eggs on carefully chosen Asclepias (milkweed) plants. She probably arrived safely in Alabama, Mississippi or Louisiana. Which was her destination? I defer to our blog visitors from NABA (North American Butterfly Association) or Xerces Society for their Comments. Did she, or was it her progeny that crossed to Gulf of Mexico and flew into Mexico? Again, Hmmmm. What we do know is that she is vivacious! For me, this opportunity and this image represent serendipity! August 29th and our Eastern Tailed-Blue (ETB) butterfly has been popping from tall verbena flowerhead to the next, silently enjoying the bounty and security of the Outdoor Gardens at Pittsburgh’s Phipps Conservatory. With a lull and brief absence of other butterflies, I shoot away, remembering that I am always charmed by these diminutive pookies. It helps that they are usually intact and fresh, providing good images. We, I have concluded, are less happy seeing images of butterflies with damaged wings. So ETB’s are usually great subjects, intact and smartly attired. We’ve posted other images of Everes comyntas and invite you to have a look at them. As to why ETB wings are nipped less frequently than other butterflies . . . I invite you to share what you know of this? Flying from April to October here in Pennsylvania, they are easily overlooked, flying away from your approach just inches above the trail you’re traveling. But they’re worth stopping, approaching and studying. Very, very soon the mature caterpillars will move from the hiding places they’ve been in these winter months and pupate. Quietly and unnoticed. Hmm. It’s July 24th at Raccoon Creek State Park in southwestern Pennsylvania. Because it’s just minutes after 9 A.M. the sun’s rays are just beginning to warm up this stand of wildflowers. Our Danaus plexippus caterpillar has gorged on Butterflyweed leaves (Asclepias tuberosa) and remains satisfied and sluggish. The following day it may have moved to Common Milkweed (Asclepias syriaca) and continue nourishing itself. These milkweed plants provide the glycosides that add a whole new dimension to this species. Those glycosides aren’t digested by the caterpillar. Instead, they remain unchanged and stable. The metamorphosis from caterpillar to adult ends with those same glycosides present in the adult. That’s why I have never seen a Monarch caterpillar that bears predator damage. I have great difficulty remembering having ever seen a Monarch butterfly that had wings or other body parts that showed the ravages of a predator. I have seen birds attack Monarch adults . . . and spit them out as quickly as they have mouthed them. The birds appear to be repulsed by something about the Monarchs. What is that something? The glycosides. It must be a very, very unpleasant taste. So our caterpillar rests in plain sight of any and all predators. Soon it will descend down the stem and remain out of sight until much later in the day. Some days later it will work to fasten itself to a plant stalk and then . . .
Have a look at our image of a Monarch Chrysalis. 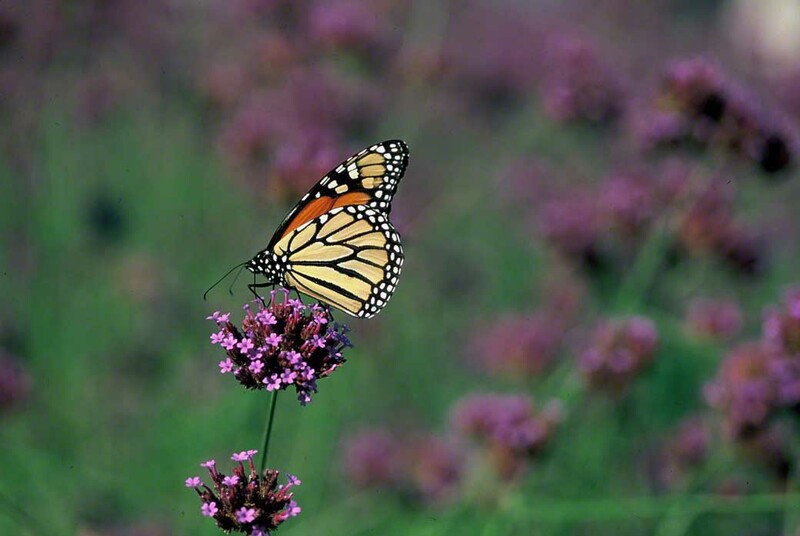 In 2010 we saw reduced numbers of Monarchs. 2011 brought an increased number. What can we expect of 2012? Our Papilio polyxenes is nectaring on tall verbena. His wings are moving faster than the eye can see, as Eastern black swallowtails do as they hover over flowers. We’re a bit distant from him considering we are shooting macro- but the end-product is eye-pleasing and those swallowtail tails look quite handsome! Solitary like many swallowtail species (see our posts of Tiger swallowtail, Spicebush swallowtail), a fresh one is quite a remarkable sight and tears you away from whatever else you were searching for. 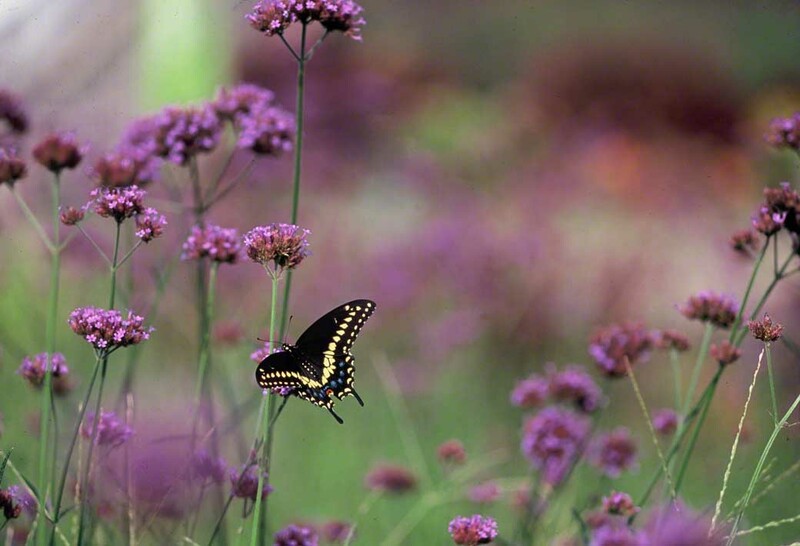 Tall verbena planted in a good-sized grouping is a magnet to draw so many butterflies. Nectaring from May to October, they are one of the best investments still available for the prudent gardener. About 24″ tall, the flower head provides photos that are extraordinary, because when you shot with one knee resting on the ground, you can include your home, your barn, your pup, your kitten or . . . in the background. Enjoy our 4 earlier posts of Eastern Black Swallowtails. Our instant photo was taken in the middle of the city of Pittsburgh. What say you to that?